This time twenty years ago, Lutosławski was dashing around Europe. On 18 May 1993, he received the Polar Music Prize in Stockholm. Four days later, on 22 May, he conducted the London Sinfonietta in the Queen Elizabeth Hall. And the following night he was back in Warsaw for the Polish premiere of his Fourth Symphony. On this occasion, he was in the audience at the Studio Koncertowe S1 at Polish Radio – it would be named after him three years later. I too had dashed in May 1993 from the QEH to S1. There was a last-minute change of programme (Novelette replaced Chantefleurs et Chantefables) and, yes, the tickets did cost 50,000zł each! 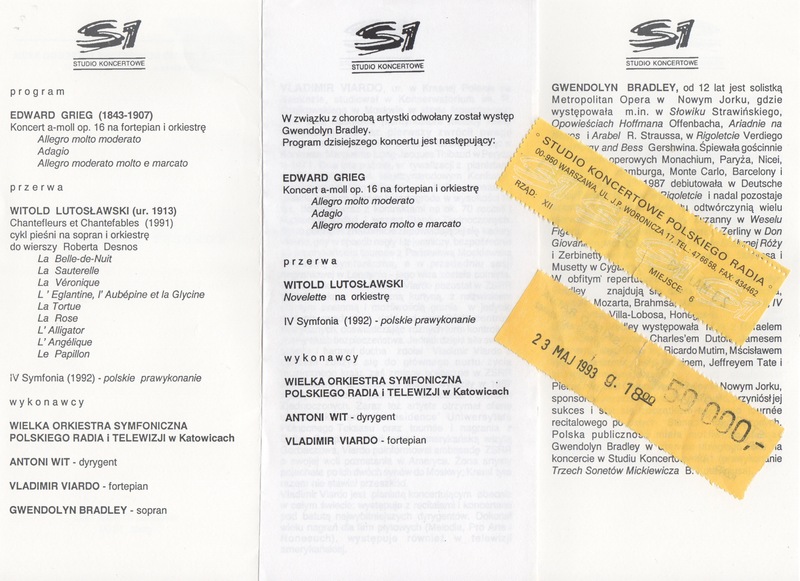 Twenty years later, I’m again in Warsaw on 23 May, this time for the premiere at Teatr Wielki of a double-bill of works by composers two generations younger than Lutosławski: Dla głosów i rąk (For Voices and Hands) by Jagoda Szmytka (b.1982) and Transcryptum by Wojciech Blecharz (b.1981). The excitement is still there!